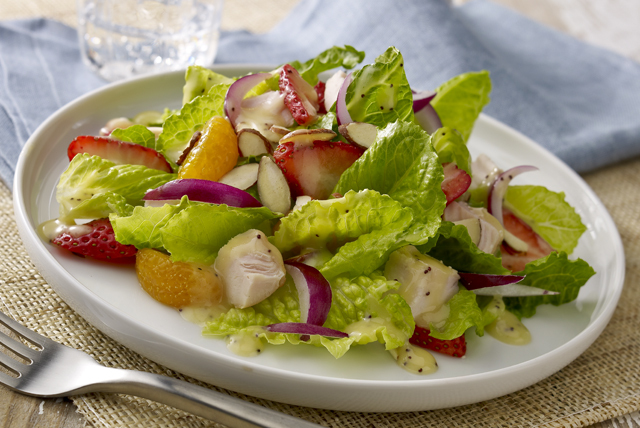 Drizzle Strawberry-Chicken Salad with yummy poppy seed dressing for a tasty dish! In just 10 minutes, this Strawberry-Chicken Salad is ready to be served. Toss lettuce with next 4 ingredients in large bowl. For a beautiful presentation of this colorful salad, layer all ingredients except dressing in a clear glass bowl. Toss with dressing just before serving. Or, toss lettuce with ingredients as directed; place on 4 salad plates. Sprinkle with nuts and drizzle with dressing just before serving. For added flavor, caramelize the almonds. Cook nuts and 3 Tbsp. sugar in nonstick skillet on medium heat several minutes or until sugar is dissolved and golden brown, stirring constantly. Spread into thin layer on baking sheet sprayed with cooking spray; cool. Break into small pieces. Sprinkle over salad before tossing with the dressing. Prepare using your favorite variety of salad greens.